Churchill was appointed Lord of the Admiralty (age 37) in Prime Minister Asquith's government, September 1911. Previously under Asquith, Churchill held positions as President of the Board of Trade (1908-1910) and Secretary of State for the Home Office (1910-1911). Churchill, with characteristic vigor, threw himself into his new cabinet position. Churchill eventually called upon retired and former First Sea Lord Baron "Jackie" Fisher (age 73) to be the Admiralty's First Sea Lord; this prompted many to predict that a clash between the two strong-willed personalities was inevitable. Prior to 1911, the British government was aware of a German massive shipbuilding program intended to replace Britain as the "Ruler of the Seas." Churchill saw Germany's interest in expanding its military might, which could and very likely would pose a threat to European stability, as early as September 1909 when he was invited to attend Imperial Army maneuvers and visit with Kaiser Wilhelm. Shortly before Churchill's visit to Germany, dissension was running high within the Asquith cabinet over the number of dreadnought ships required to meet Germany's anticipated naval expansion. The then First Lord of the Admiralty advocated six; Lloyd George and Churchill, both out-spoken social reformers and leaders in the opposition to invested armaments spending as a direct threat to welfare spending, suggested four. First Sea Lord Admiral Fisher, knowing the formidable power of a Lloyd George-Churchill union, quipped that the four dreadnoughts should be named "The Winston," "The Churchill," "The Lloyd," and "The George"! Much later with hindsight behind and in typical Churchill style, Churchill summarized the dreadnought debate as "The Conservatives wanted six; the Liberals wanted four; we compromised on eight." Churchill and Lloyd George adopted a different posture in the summer of 1911 when a German warship appeared off the coast of Agadir, Morocco, an act interpreted to intimidate the French. Churchill was determined to see the Royal Navy's command of the seas not usurped. He believed Britain's honor and interests required her to be ready on land and sea to aid France and Belgium if either was threatened by a dominant foe. Churchill's naval budget presented to Parliament in March 1914 was a staggering 48 million pounds. Importance of and priority to welfare spending were in the past; strong national defense on the seas was in. The Daily Telegraph wrote, "The Navy has never in its long history had a more persuasive spokesman in Parliament than the present Minister." Churchill had 59 dreadnoughts in the Royal Navy and planned to add two for every one Germany built; all compromise over numbers was rejected, bringing forth severe criticism from his colleague and advocate of welfare spending, Lloyd George. Churchill pushed through support and took credit for founding the Royal Naval Air Service. His advocacy for a strong air power was received favorably. 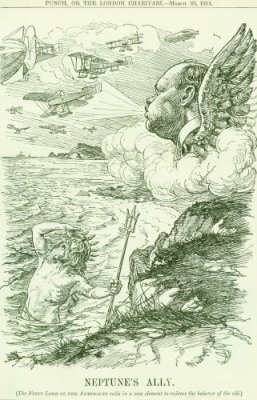 The 1914 PUNCH cartoon, "Neptune's Ally," depicts Neptune observing a force of biplanes flying over the water with a winged Churchill providing the force. Great Britain was to find itself at war with Germany on August 4, 1914. Churchill's tenure as Lord of the Admiralty was not without strife, criticism, and tragic events. Churchill was responsible for removing from office no less than two Sea Lords, was forced to accept the resignation of a third, and had a severe falling out with his "hand picked" out of retirement First Sea Lord, Admiral Fisher. The tragedy that befell both Churchill and Fisher was the ill-fated and ill-planned Dardanelles land and sea offensive. The Dardanelles Campaign commenced on March 18, 1915. A combined British and French fleet was to sail up the Dardanelles straights into the Sea of Marmara to shell and capture Constantinople, thereby forcing Turkey to quite the war as Germany's ally. The offensive went disastrously wrong from the start; three battleships were sunk and three disabled by Turkish mines and shore batteries. British, French, Australian and New Zealand (ANZACS) ground troops put ashore at Gallipoli Peninsula were met with severe Turkish resistance. In the course of the next several months, casualties escalated into the tens of thousands. Fisher resigned in protest to Churchill. Prime Minister Asquith was forced to remove Churchill as Lord of the Admiralty. Churchill eventually resigned from the Asquith government and prepared himself to go to France as an officer in the Queen's Own Oxfordshire Hussars. In France, Major Churchill joined the Grenadier Guards for training. On January 1, 1916, Churchill was appointed a Lieutenant Colonel commanding a battalion of the 6th Royal Scots Fusiliers. Churchill was to distinguished himself in the trenches of the Western front and in the process earn the respect of his men; however, his stay on the Western Front was short lived. Churchill returned to England in May 1916 to fight "political battles." Lloyd George, now Prime Minister, appointed Churchill to the cabinet position of Minister of Munitions in July 1917.